Oh I miss posting nail arts! This morning, while I was doing the laundry, I was also prepping my nails in between the task for a nail art later in the day. I will have a contract signing on Monday and I thought of getting my nail polished. I plan to wear my off-white casual dress. Again I will go for basic. I hope I don't bore you guys of basic things. Nothing is safest but to wear those colors especially with the nature of my work. There are times that I picked some colorful pieces out of my closet but ending up wearing grays, whites, blacks. I decided to do a French tip with a twist. If you want to know how I did this, keep reading. Step #1. Obviously, you know already the colors you need. 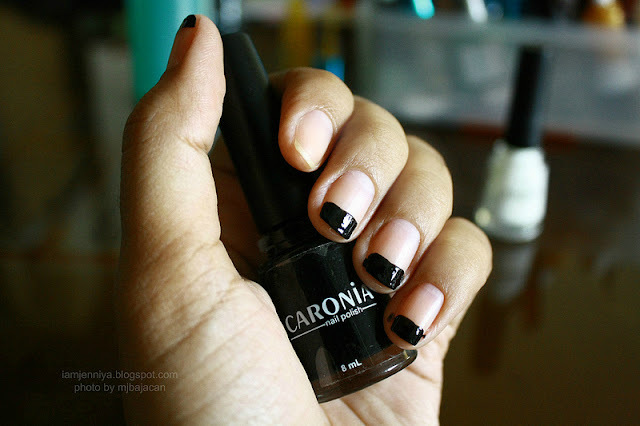 I picked Caronia Regulars in White Satin and Black Velvet. Step #2. Using the Black Velvet, line a tip. If you want it just this simple, put a top coat and you're done. It's up to you. But I opted to leave my one nail unpainted for a twist. Step #4. 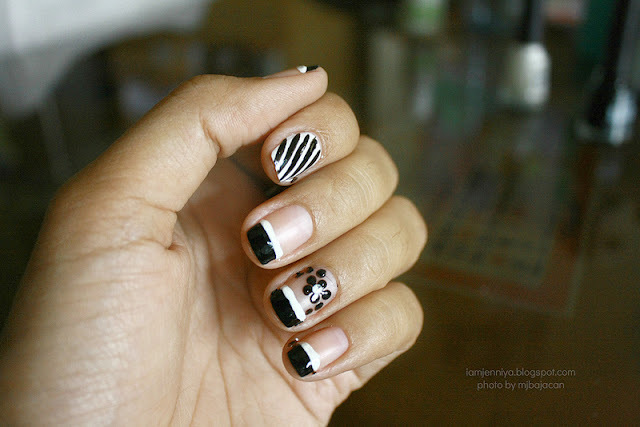 Using a nail art brush, I dipped it at Black Velvet and draw slanted stripes onto the white one. Step #5. Then, I added flower design for more fun. Again, this is optional. Using a toothpick, I dipped it at Black Velvet and made 5 dots. Connect the dots to the center to make it a flower. Add some dots on the sides. Then make a dot at the center of the black flower using the White Satin. Step #6. Apply your favorite top coat. You're done! French tip with a Twist! I hope you find this tutorial helpful. Try it. I swear it's so fun and easy to do. 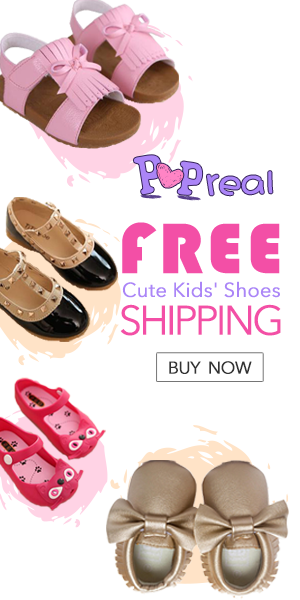 These are very pretty, love the colors =) new follower! I like the zebra pattern! Nice job. 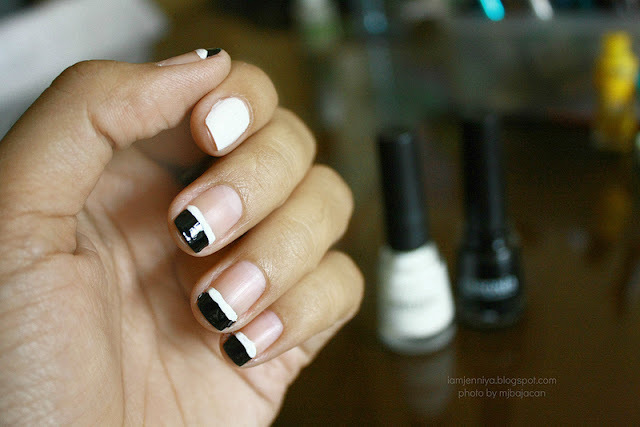 love the black and white combination! one with the diagonal stripes! I'd like to invite you to join my new giveaway as well my dear! Thank you, Mellie. Let me know when you've tried it. I'd love to see it. 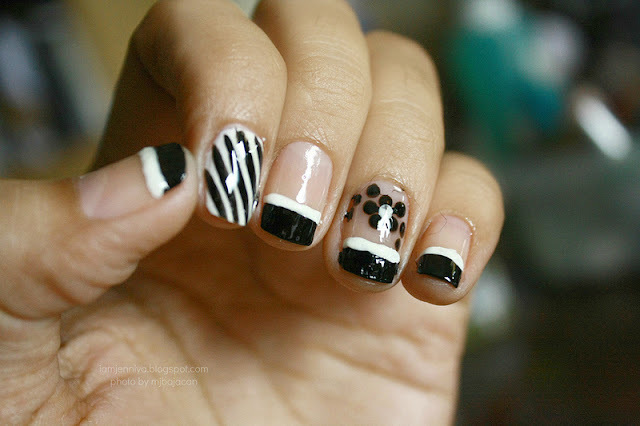 love your nail art, trying this out soon!! Love your nails!! you're an artist! 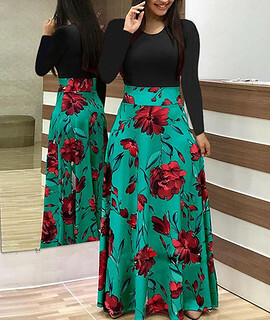 I really like the one with the flowers! Lovely! Yeah, it was really nice! Thanks! :-) Love your nail polish! thank you dear lovely girl! Hi, you have a lovely blog! The manicure is amazing! wow!! amazing! I love it ! 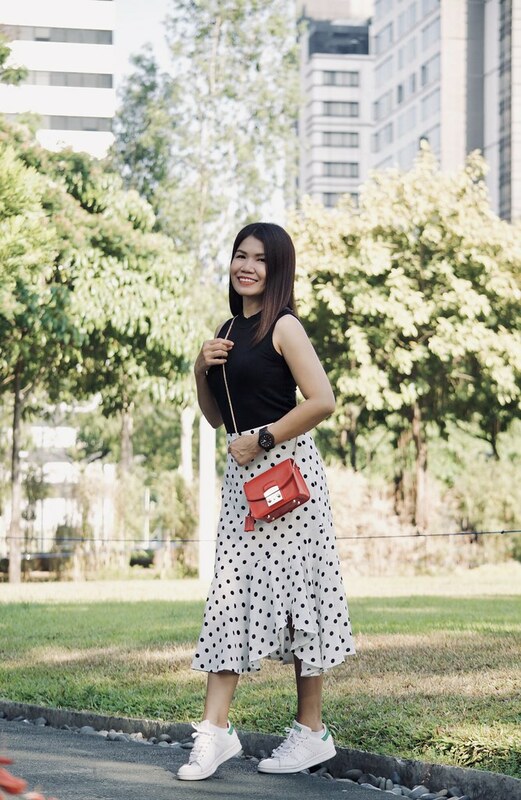 Hi, thank you for your comment on my blog! done following you, mind to follow back?